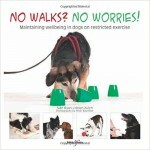 Previous ReviewChaser by Pilley John W.
SUMMARY: Exhaustive manual for helping dogs on restricted exercise. AUDIENCE: Written for the layman, with well-illustrated contents and no jargon. Style and contents: Short, richly illustrated manual on how to prepare your home and your dog for a period of confinement and restricted exercise. I love that they hired a professional photographer and that the pictures are full-length. The book is part of a great collection, and had its familiar quality design. The book was very well illustrated. I contradict this point below, but the exhaustive list of the training skills a dog ideally needs to master pre-revalidation is a unique, and valuable resource. Invaluable insider’s tips on how to prepare the dog for, for example, hydrotherapy and post-op vet exams. So the book didn’t only focus on home revalidation, but on all the post-operative challenges in the dog’s life. The game section was a little light for my purpose. I would love to see future edition beef this section right up. I also found the games section a little hard to navigate as I wanted to quickly look up and compare different games, but the games appeared in the main text and do not each have their own dedicated section/box. The said training ran pages and pages (e.g. teaching the dog not to get agitated when hearing the doorbell or seeing the leash, to walk gently on the leash, to get used to getting prodded all over and carried, to a muzzle and a gentle leader, etc.). It would take weeks and weeks to get through this list of skills, when most owners are lucky to get a couple of days’ notice before the dog goes under the knife. An interesting ‘keep your dog away from my convelescent dog’ protocol: just pop up your umbrella to shield your dog behind it. I am unsure how well this works in practice, as I imagine the other dog would just renew its attempts to get to your dog, but the idea seems worth a shot. The verdict: I would definitely recommend this book to dog owners who are planning a surgery for their dog. But be warned: purchase it way ahead of time if you want to get the full value out of it. Browse the Book Review archive. Genre: owner manual. Book Authors: Ryan Sian, Zulch Helen. Reading Level: Owners. Star: 3. Bookmark the permalink. Post a comment or leave a trackback: Trackback URL.